San Francisco-based company called Roam Robotics is to provide its first exoskeleton and it's aimed at skiers. Skiers? Sounds strange. One would think the last thing a skier would want to think about is a heavy suit with sundry attachments weighing the person down when all the skier wants is the very lightness of being on a sunny, clear afternoon. Wrong. The Roam exoskeleton is quite interesting, customized to enhance, not hinder, the skier's experience. The purpose of the exoskeleton is to help people ski longer—and ski stronger. Daniel Terdiman in Fast Company weighed in, saying "skiers better get ready to start seeing people zipping by them effortlessly on the slopes wearing what appears to be little more than standard leg braces." Roam's founder and CEO Tim Swift said in Fast Company: "We set out to make devices that completely change the cost curve and the weight curve." Swift holds a Ph.D. in mechanical engineering from UC Berkeley. Main ingredients: Lightweight plastic, fabric and machine learning. The company said its first release "are already spoken for, but there will be more on the way." They said if a person wants to reserve one or will be in the Tahoe or Park City areas and would like to try a day rental, "reach out to us and we'll be in touch." The company site posted a "Join the Waitlist." So what is their exoskeleton all about? Think shock absorbers for your legs, said Swift, in trying to mimic what your quads are doing, and taking a load off your legs. It consists of two parts. First is the backpack (for power and processing), and strap-on exoskeleton parts for the leg. You connect it to your boot. Strap in on to your thigh. David Nield in New Atlas stepped readers through further how the system works. "Through a combination of sensors and software calculations, the exoskeleton adjusts torque at the knee to support what your legs are already doing, and the accompanying app for Android and iOS lets you adjust just how much help the exoskeleton offers." How does machine learning enter into the mix? The machine learning element is meant to understand how you ski, said Terdiman, "and anticipate when you're going to make a turn in order to deliver the extra torque just when you want it." Extra power goes to your legs when you turn. Terdiman reported that "Roam is hoping to get the public into its exoskeleton by next winter, and plans on making them available at first at resorts in the Tahoe and Park City, Utah, areas." At the Roam Robotics site, Terdiman was strapped into a skiing treadmill. He wore an exoskeleton prototype. Once activated, its advantage kicked in. Terdiman discovered the system "takes the pressure off the quads, especially when turning, when it's needed most." Each time he began a turn, the system actuated, delivering power to the legs, "and literally making me feel like it was lifting me up–which, of course, took the pressure off my quads." 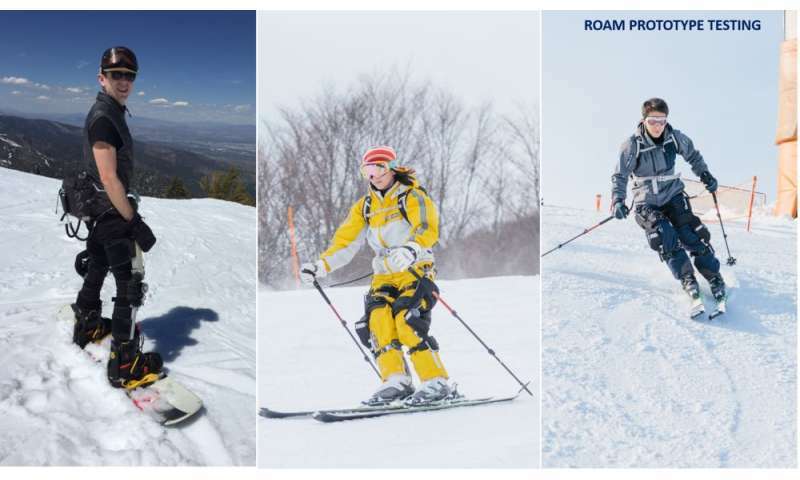 Roam's premise is that for many people skiing is more than a way to pass time. It's a passion. And the suit is an advantage for people at all levels. According to Fast Company, "Experts should find themselves able to do turns they couldn't before, Swift predicts, or go comfortably into the backcountry, while leisure skiers should be able to stay out on the slopes all day and even ski multiple full days in a row, even if they're not in shape. Older skiers should be able to ski like they did when they were younger and stronger." New Atlas said, "At the end of the day you can fire up the app and check your performance statistics too, everything from top speed to the routes you took down the mountain." .. Or just get in shape and enjoy the excercize you lazy git!